I said I would finish my post on narrators today but I've decided to put that off until Monday. Today lets revisit one of my favorite topics and examine how to write an engrossing murder mystery. In The Guilty Vicarage Auden--a self-confessed addict of murder mysteries--talks about what elements go into creating a great, wonderfully escapist, murder mystery. The state of the story world before the murder. The detective takes the case. The detective crosses the threshold into the special world of the adventure. Something might happen to lock him into the investigation. Perhaps he discovers he needs the money, or a rival detective bets he will fail, or his love interest is arrested for the murder. Clues. The detective discovers many clues. Some of them are false (red herrings), some of them are true but not related to the murder (irrelevant), and some are true and related to the murder (critical). The detective's job is to figure out which clues fall in which categories. Suspects. The detective interviews suspects, gathers evidence and thinks about the crime. Perhaps more murders are committed. If there is a B-story it will come into play around points (4) or (5), if not sooner. False success. It seems as though the murderer has been found. This could be someone the police have fixed on and the detective doesn't agree, or it could be that the detective is working from false or insufficient data and identifies the wrong character as the culprit. The police, and perhaps even the detective, believe the case is closed. This would be a good place to have something exciting happen in the B-story. Something ruffles the still waters of the newly accepted status quo. Suspicion is raised that the person arrested for the murder might be innocent. Everyone comes to know that the person they thought was the murderer really isn't. Perhaps someone comes forward with evidence that the person thought to be the murderer couldn't possibly have committed the crime. For example, the suspected murderer is a parent who believes their child is the murderer and, since they feel they are somehow responsible for their child's actions, seek to take the blame. Perhaps evidence is discovered which reveals it was impossible for the supposed murderer to have done the crime(s). Perhaps there's another murder while the suspected murderer is behind bars. Perhaps something, an idea, was nagging at the sleuth but he couldn't quite but his finger on it. Something happens, he sees something, hears something, remembers something, that convinces him the person accused of the murder is innocent. Or all seems to be lost. The police and/or the detective suspect the wrong person. Perhaps they're on the right track but something--perhaps some item of information--they've accepted as true really isn't and is leading them astray. Of course it doesn't have to be misinformation that throws the detective off. Perhaps his personal life is blinding him to something (his love interest is leaving him; children in crisis), perhaps there's someone he believes is above suspicion that he hasn't examined seriously enough; his mentor, for instance. The mentor might not be the murderer, but the detective's failure to take that possibility seriously has, perhaps, kept him from fully examining those around the mentor, like the man's personal assistant. 11. "Use The Force, Luke." This is the detective's 'ah ha' moment. If, as I suggested above, the detective believed something false that was tripping him up, this is removed. If there's a B-story, then this is where the resolution to the B-story could supply the missing piece of the puzzle. This is where the detective gathers everyone together, lays out all the clues, explains which category each falls in (red herring, irrelevant or critical), unveils the deep dark secrets the suspects were hiding, and, finally, unmasks the murderer. The guilty party has been exposed and so we know that those who appear innocent really are. The detective has removed the pall of suspicion from the community and they can return to their ordinary lives. There's a lot more to say about this but that's enough for now. I'd like to come back in the near future and talk more about setting (both human and physical) and characters (suspects, detective, murderer). - "How To Write A Murder Mystery," by me, here. - "The Guilty Vicarage: Notes on the detective story, by an addict," by W.H. (Wystan Hugh) Auden over at Harpers.org. This article is from the archives and was originally published in Harpers magazine in 1948. - "Raymond Chandler’s Ten Commandments for Writing a Detective Novel," by Jonathan Crow over at OpenCulture.com. 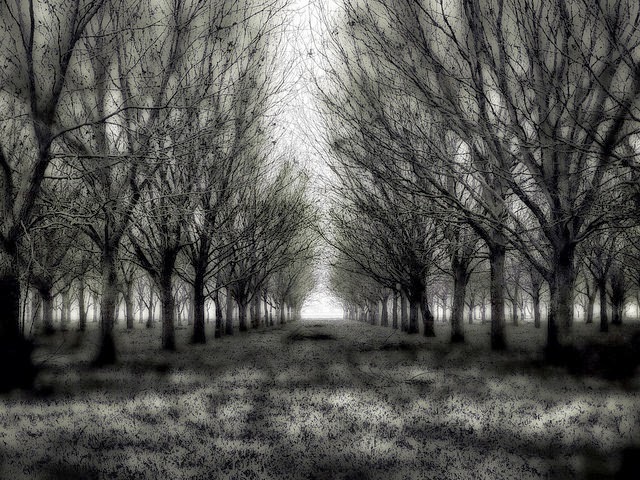 Photo credit: "Orchard At Twilight" by Karen Woodward under Creative Commons Attribution-ShareAlike 2.0. Photo is based upon Anne Worner's photo, "In the Clearing (Explore 10/16/2013)", licensed under a Creative Commons Attribution 2.0 license. Thanks for this posting. I think your articles on structure are helping me work through the "middles" of my books. The beginnings and endings are "easier" but oh those middles can be rough. "The Great Swampy Middle (or GSM) knows no fear, no mercy, no regret. It doesn't come after you. It darned well knows that you're going to come to it. It knows that you're going to be charging along, sending up the spinning plates, ripping out the strong character introductions, planting cool bits into your story for the future, and generally feeling high on life. And just then, as you get all that fun opening-story stuff done, it pounces. And suddenly, you're staring at a blank word processor screen trying to figure out how to get your story through the next paragraph."